I shave my legs in the shower, I put some nice underwear on (not that I’m expecting anyone to see it…). Pick out my standard winter date outfit (jumper dress, tights and boots, in case you’re interested). I curl my hair. Carefully apply my make-up, take three attempts to get my eyeliner flicks right, but finally nail it (who am I kidding, I never nail my eyeliner flicks). I leave the house, carefully planning how long it will take me to get there and try to arrive a couple of minutes late because I don’t want to be there first. I’m going on a date. A Tinder date. I’ve lost count of how many Tinder dates I’ve now had, clearly all unsuccessful! Am I nervous? No. This just feels like something I do now, so what is there to be nervous or excited about? Do you remember back in the day, you’d meet a guy in a pub or something and he’d ask you out. You knew he was attractive, you knew there was a spark, so when it came to getting ready for the date you’d have all these little butterflies fluttering around in your stomach. Oh God, I miss that! But with Tinder, or internet dating in general, that spark is not guaranteed. You can have ‘banter’ in messages, a carefully constructed text message can be designed to make the recipient splurt out their drink in laughter (is splurt even a word…? I don’t think it is, but I reckon it conveys my meaning quite well so I’m keeping it. I don’t even care.). But in person, that rapport you built up virtually is hard to recreate, unless you actually have that elusive spark. I think I’ve said on this blog before that I struggle to be attracted to men I don’t really know (you can read that here if you’re interested). I tend to only develop feelings for people that I’ve spent time getting to know and that doesn’t really work with Tinder. It’s a site for dating (or hooking up depending on the person; message me with ‘what’s up hot stuff?’ and I won’t imagine you’re looking for a deep emotional connection) it’s not a site for ‘hey let’s be friends until I decide if I fancy you’. There are literally thousands of men and women at your fingertips. I hate to admit it, but I once started swiping while my date was in the loo *I’m sorry I’m sorry I’m sorry*. But that’s my point, you’re on one date that isn’t going well so you can just jump online and find the next one. I mean, I’m pretty sure men have done it to me too! Dating isn’t a rare thing with a person you have a genuine attraction to. It’s like shopping; you walk around the shopping centre and you see a dress in the shop window that you think you might like, so you go into the shop and try it on. But it doesn’t quite fit or it doesn’t suit you. So you put it back and move on to the next shop. Your date has become as disposable/replaceable as that dress! Which means that you are constantly up against all this competition! You know that bloke you were speaking to for a week and you were just waiting for him to ask you out, but then he goes quiet? Well, I would put money on the fact that last night he went on a Tinder date with a pretty petite brunette called Laura and he fancies her a lot so you’ve been relegated to the Tinder waiting list. He might message you again if it doesn’t work out with Laura. Or he might marry her. So there’s that. So yeah. 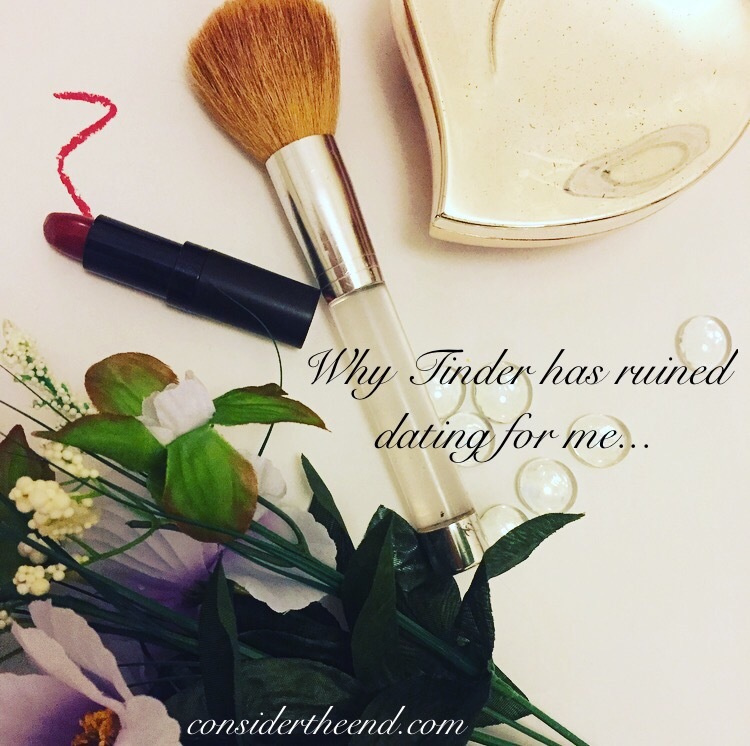 Tinder has ruined what dating is or should be. At least is has for me. It’s no longer something to get excited about. It’s a chore. After weeks, months and years of trying on dresses with no success you eventually give up and decide you don’t want a dress anymore. In fact, the thought of trying on any more dresses makes you want to just curl up into a little ball on the floor and sob. Maybe you’ll buy a skirt instead. Or maybe you just won’t bother trying to find the perfect dress again. Who needs dresses anyway? I say all this, but then you’ll find me swiping away looking for the next date. I’ll keep going through the routine of shaving my legs, picking out my date outfit, curling my hair and perfecting my eyeliner flicks. Why? Because this is the world we live in and this is how dating works in 2016. The whole world dates on Tinder, or so it seems. So even if I meet a guy in real life he might still be swiping while I nip to the loo looking for his Laura [EDIT: he’ll be looking for his Laura on Tinder, I won’t be looking for her in the loo]. I’ll still have competition. And well, I guess you gotta be in it to win it, right? Oh yes, I’ve read that article. It is incredibly depressing. There’s no hope for us, really. I think the struggle to create the spark and the date disposibility of Tinder i.e. date doesn’t work out, you can swipe again to chat to someone else makes it more of an addictive game than an outlet to meet your ideal match. Great read, thanks for sharing.